Anyone can make a stylish and on-trend birdhouse with this DIY tutorial by Lori Craig. This project showcases a few of the techniques from the DIY Paint System by Tommy Art. Are your birds singing this spring? No ordinary bird houses around here! Not a chance! Only on-trend farmhouse style! I actually picked this piece up for decor to my mom’s screened in porch, but I couldn’t resist showing if off in the midst of our April blooms. Welcome spring! 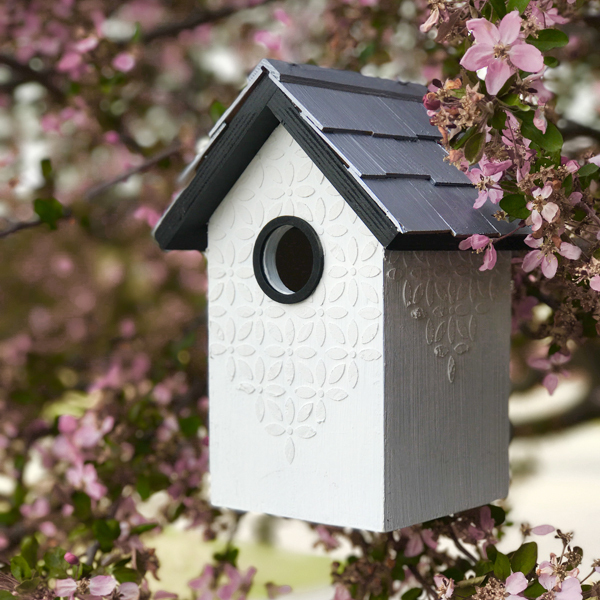 I wasn’t even “in like” with the before decor of this birdhouse, but the simple structure was appealing to me! Wood birdhouse - this one needed some design help! This technique uses Tommy Art Sand Paste for a beautiful texture effect. Complementary colors of the White Mineral Paint and Sand Paste allow for calming beauty, unique to the farmhouse style with thick, rich Tommy Art Silver Metallic for the “tin roof”. This old birdhouse is ready for a Tommy Art transformation. 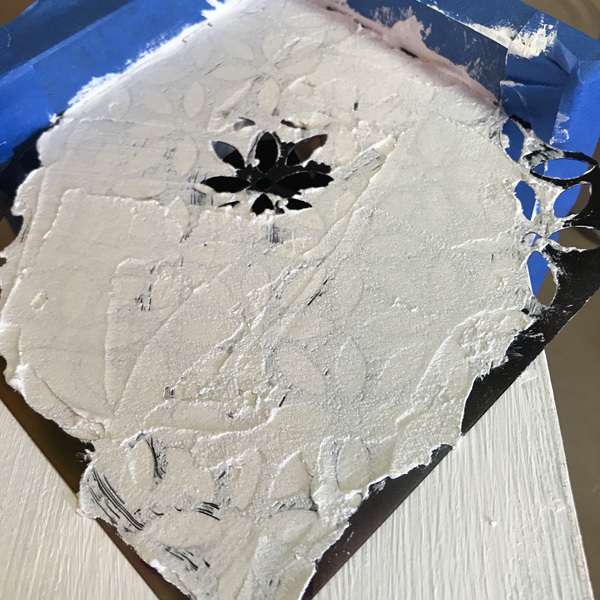 For this project, you'll use Tommy Art White Mineral Paint, Tommy Art Sand Paste, along with the Tommy Art Silver Metallic. If you are using your project outdoors, you’ll want to finish with Tommy Art Transparent Chalkboard Varnish. You'll also need a stencil, paint brushes and a palette knife. First, clean the surface of the birdhouse, or whatever item you intend to transform. Before I got started with tape and paint, I used my palette knife to gently remove the black frame of the hole. It was glued on pretty tight, but I hit it with a heat tool to soften the glue, and it loosened right up. Use painters tape to protect areas that you’d like to keep clean - in this case the black trim of the room. Apply the base color (White) and let dry completely. A soft bristle brush will yield the smoothest finish. White Mineral paint lacks pigment found in other colors, and you may find more multiple coats necessary. Simply allow paint to dry between coats for best results. 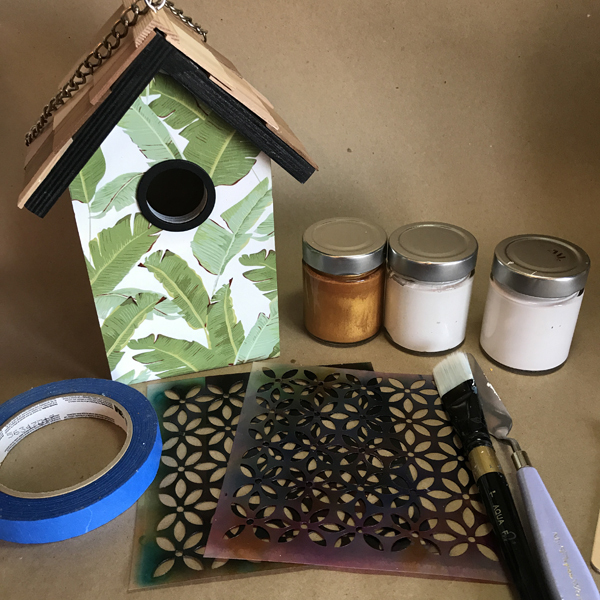 For beautiful texture accent, arrange stencil to front of birdhouse. If desired, use low-tack painters tape to secure in place. Dip a small amount of Sand Paste with palette knife and slowly apply across surface of stencil, sweeping in one direction. Resist the urge to sweep back and forth. When desired area is covered with Sand Paste, lift stencil straight up. Allow paste to dry. Repeat Step 2 on all desired surfaces. Using a thick bristle brush, apply generous amount of Silver Metallic Paint to create the tin roof. You might notice I changed my mind from the Gold Metallic Paint in the supply picture. You are allowed to do that! Permission granted! ;) Allow to dry. Re-apply the hole frame. I used Better Adhesive for it’s all-weather hold. If you are using your project outdoors, you’ll want to finish your project with Tommy Art Transparent Chalkboard Varnish. Ultimately, my birdhouse will be used on a screened porch, so I skipped this step. Complete! If you try this project with the Tommy Art DIY System, let us know in the comments, we'd love to hear your thoughts.